“I think it is important for us to add our voice to this issue because Searsport is not just a Searsport issue,” said Councilor Joe Baldacci. “This is a regional economic issue. It’s going to affect the economies of cities and towns throughout Maine in terms of the movement of goods and services. The article appeared in the BDN by Dawn Gagnon. Click here for the entire article. 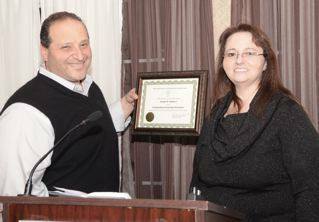 Attorney Joe Baldacci presented the checks to the organizations on behalf of the bequest. Bangor Humane Society and St. John’s Catholic Church each received checks for $395,000 Friday, presented by Gillespie’s longtime friend and personal representative Ruth Spellman and attorney Joseph Baldacci of Bangor, during individual press conferences at the respective facilities. “Shann lived a spare life, but gave to [St. Joseph] hospital, church, Humane Society and students. She didn’t ask for recognition. She lived a selfless and caring life. She earned her money in Bangor, lived here, and then invested her money here,” Baldacci said. For more please go here. Last year the state cut funds to cities across Maine. Bangor was hit hard receiving only $2 million, when the city used to get $5 million. Slashing this revenue sharing program has resulted in hardship. “Revenue sharing was based on the now non-existent concept that there should be state-local partnership to fund basic local services without over burdening the property tax,” said City Councilor Joe Baldacci. This article: Bangor officials call on state to ‘honor its obligations,’ restore revenue sharing By Nick McCrea, of the BDN explains more. Before Joe Baldacci became a Bangor City Councilor he fought to keep Dorothea Dix open and is currently working to restore services and help repurpose the facility. “State legislators need to work with the city council to protect the mission of this hospital. We are very fortunate in Maine to have someone of the caliber of Dr Michelle Gardiner who is now serving as the medical Director of the Dorothea DIx hospital,” said City Councilor Joe Baldacci. Excerpt the Bangor Daily News — The Community Connector’s Odlin Road bus route is close to being saved for the year, but a significant loss in revenue expected next year could mean deeper cuts for the bus system. 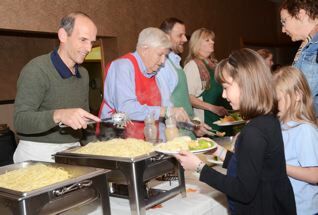 The brother’s Baldacci, Governor John Baldacci and City Councilman Joe Baldacci, hosted a spaghetti benefit dinner at the Spectacular Event Center in Bangor on October 30th. The line for the fundraiser to save the Community Connector’s Odlin Road bus route went out the front doors of the center far into the parking lot. Over 400 concerned community members turned out to help the cause. “There are no words to describe this outpouring of support from the community. I could cry. They heard about the event, they want us, and the need us. It’s the greatest thing ever,” said interim bus superintendent, Laurie Linscott. Read more here..
One of the biggest community projects I’m proudly associated with helping on with the City Council is the new Cross Insurance Center. This story cannot be told enough- it is a story about a community that honestly struggled for decades to deal with the issue of what to do with Bass Park and with a declining Auditorium which had served generations from around the state. On the day the new $65 million Cross Insurance Center opened it became one of the top venues in New England for shows, concerts, basketball games and performances of all kinds. It will serve tens of thousands of people throughout eastern and northern Maine and it will create lifelong memories just like the old Auditorium did for many generations. For the Bangor Daily Article click here. Councilor Joe Baldacci publicly commended Bangor Finance Director Debbie Cyr for her “dedicated, tireless” work and foresight while selling $56.5 million in tax-exempt general obligation bonds last July. That move, which eliminated much taxable debt, saved the city about $750,000 off 2010 projections and means total annual debt service will not exceed $2.9 million. Another factor was the $3 million Cross Insurance Agency has agreed to pay the city over 15 years for exclusive naming rights to the arena. 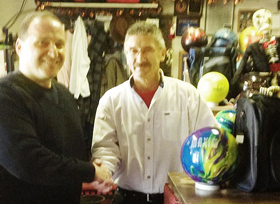 From the Bangor Daily News By Ramona du Houx, Posted Oct. 10, 2013, at 11:08 a.m.
Councilman Baldacci and Andy Meucci of Family Fun Lanes. Andy is donating a twelve pound bowling ball and bag to be auctioned off at the Oct 30th “save the buss route” Baldacci spaghetti dinner. Bangor City Councilor Joe Baldacci and former Governor John Baldacci will be co- hosting a Spaghetti dinner on Wednesday, October 30th at the Spectacular Event Center in Bangor from 5 to 7 pm. The former governor will serve up the spaghetti— with his family’s secret sauce. Read more here. Over the weekend, US House Republicans refused to give up their efforts to defund the Affordable Care Act, even though it is the law of the land, upheld by the Supreme Court. Their leadership stated that as long as the ACA is funded they would shut down the federal government at midnight, September 30th. Councilor Joe Baldacci held a conference call September 30th, with members of the Obama administration about the possible affects a shut down would have in Maine. “According to what we learned on the call homeland security, border patrol, food inspectors, curtailments in non ‘critical’ defense operations will happen… it’s across the board as 800,000 furloughs nationwide will happen,” said Bangor City Councilor Joe Baldacci. Read more here. “House passage of H.J. Res. 59 advances a narrow ideological agenda that threatens lives, our economy and the interests of the middle class,” said Bangor City Councilor Joe Baldacci, a potential candidate for U.S. 2nd Congressional District. “I challenge all of the Maine Congressional Republican candidates to repudiate these extreme measures that threaten people’s lives and livelihoods.” Read more here. City Councilman Joe Baldacci is so committed to the cause to keep the Odlin Road bus route operational and he will forego his City Council salary to help defray cost. The city has cited their goal of saving roughly $20,000 dollars as the primary reason for closing the route.The shut down of the bus route was proposed even though ridership has steadily increased. To find out more click here. During Monday’s meeting, Councilor Joe Baldacci said the city should be concerned that the retirement cost shift to the city likely will be permanent, but he said he’s concerned the funding to cover it in its first year will not be extended into future years. That would mean the city would need to find a way to fund it or the school district would have to find places to slash. 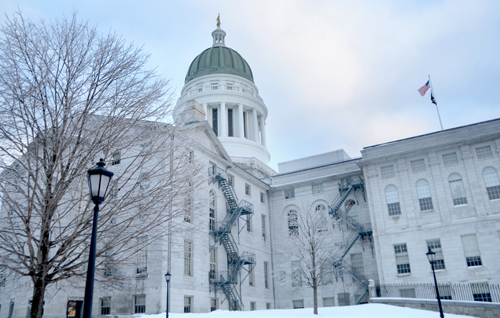 Bangor City Councilor Joe Baldacci has called on the Bangor Legislative Delegation to reverse the 25 percent cut dealt to the Dorothea Dix Hospital Psychiatric Hospital by the current LePage Administration and the Republican controlled Legislature in 2011. “At a time when we are dealing with too many untreated people on our streets and in our jails it’s frankly time for legislators to sponsor legislation to reverse these ill considered and unwise cuts at the hospital,” said Baldacci. “There is no question that for many families in eastern and northern Maine there is an urgent need for adequate mental health care. As a vital part of that continuum of care, we need to preserve this important safety net and restore adequate funding.” To read more click here. Posted July 07, 2013, at 4:54 p.m.
Bangor officials are preparing to work with the state in hopes of ironing out a deal to put to use some 100,000 square feet of vacant space inside Dorothea Dix Psychiatric Center as housing for those who don’t require full hospital care. Bangor International Airport’s success and growth has been a product of a wide range of community efforts and work. When I served as Mayor in 1999 I was fortunate to work with then Governor Angus King who listened to what we needed and helped bring almost a million extra dollars to Bangor for improved marketing of the airport. This article deals with with the 2000 agreement I worked out with the City of Halifax on behalf of Bangor International Airport and the City of Bangor to protect the city’s lucrative pre-clearance business on international flights. It takes a village to build an economy and create jobs. The first step is people working together constructively. As the chair of the Bangor City Council’s Special Committee on Halifax Pre-Clearance, I am pleased to report that the committee accomplished its mandate and the Bangor-Halifax agreement approved in October is a direct product of the framework created by the committee in public session during its last six months. What is Halifax Pre-Clearance and what does it mean to Bangor? Halifax, Nova Scotia International Airport submitted an application to the U.S. government pursuant to a 2001 U.S.-Canada Air Service Treaty to have originating pre-clearance services in Halifax. This would allow travelers who originate in Nova Scotia to pre-clear U.S. Customs in Halifax instead of being required to do so in a U.S. airport. The U.S.-Canadian Treaty allows such applications. Read more here. 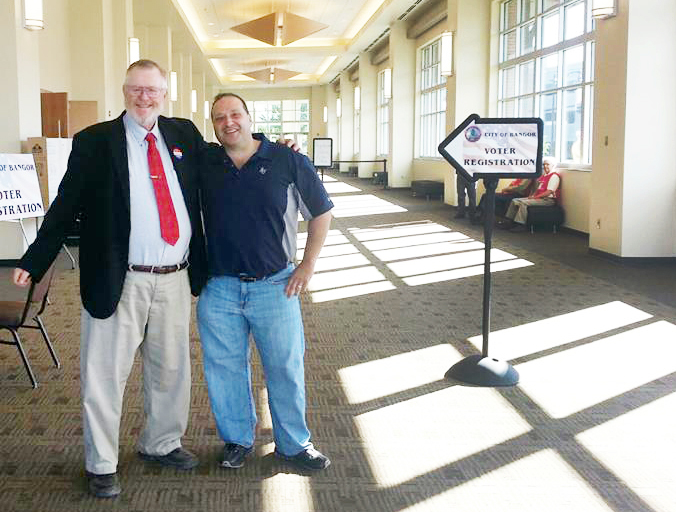 Councilman Gary Palmer with Councilman Joe Baldacci at the the polls to get out the vote! Voters are heading to the new Cross Insurance Center on Main Street Tuesday to decide whether to validate the city’s $42 million school budget and whether to support a $3 million bond to repair the roof on the Bangor Public Library. Read more here. Posted Feb. 18, 2009, at 9:33 p.m.
BANGOR, Maine — City councilors voted Wednesday to move forward with a new arena market study, overturning a decision they made two weeks ago and quelling what one councilor called a tempest in the community. Councilors unanimously agreed to appropriate funding for a new study but also instructed City Manager Edward Barrett to narrow the parameters of that study to make the arena affordable and economically viable. Read more here. By Eric Russell, BDN Staff, Posted June 27, 2011. Nealley said that while he was happy the council held the tax rate flat, he was disappointed that he and his colleagues did not go a little further to pass a budget that decreased taxes. Read more here.